The Book Garden: Look who's blogging again! Plus, a little giveaway too! Look who's blogging again! Plus, a little giveaway too! It's been a while now, hasn't it? And oddly enough my follower count only dropped by maybe a handful of people, some of which probably did not even miss me, most likely not even remember subscribing to my blog once upon a very long time ago. Of course there will equally be those who'll break out in cheer now. After all, four months have passed and not a peep to be heard, not a post to be seen, not a ... well, you get the general idea. Some of you might have stopped by my other blog The Picture Garden for a daily dose of photography and some handmade goodness during the past few months and in case you're not one of them, feel free to drop by for a visit. That being said, I've obviously decided to be back, maybe not in full swing, but still a lazy shuffle should do for starters. Now what constitutes a lazy shuffle in regards to the big bad book blogging world? Good question. I haven't got a clue. It just sounded nice. The point is, I will be back to rambling about anything bookish and to be honest, this was pretty much a spur of the moment decision. In other words, no scheduled posts or anything. I can feel the blood pumping faster. Fear rising. Just kidding. So what better way to welcome my dear readers back than by rewarding them for sticking around and reading this post in its entirety. It's a short post. That should save me aka make this whole reading thing doable. I'm going to pretend now that I won't be the only one reading (checking for typos, rather) these lines and that I have your full attention now. Behold ... some lovely bookish goodies which will soon find a new home in someone's reading nook! 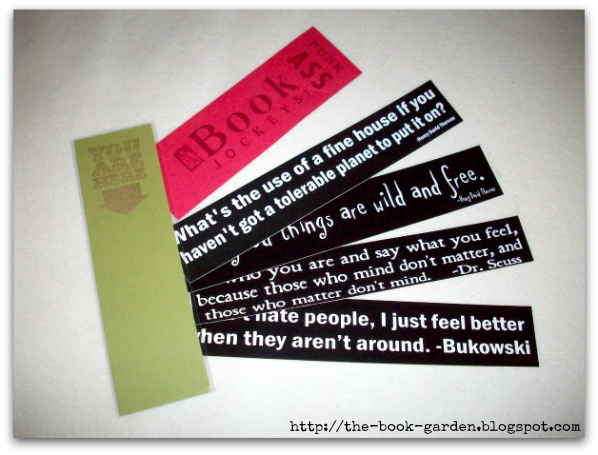 Feast your eyes on some handmade bookmarks and literary quote stickers (all purchased from various Etsy shops). The giveaway is open worldwide and will run for a full week. Time flies, doesn't it? Somehow it seems long, but still the months went by in a blur. To be honest, compared to a year ago, I'm following fewer book blogs as it is, plus I haven't had much time to catch up with what's going on in blogosphere in general either. And I have to agree, some bloggers could definitely use a good editor. So, if you ever find some horrible mistakes in my posts, feel free to let me know (just don't charge me for it, haha). Hey Birgit! It seems that the book blogging world has come to a bit of a slow phase in general. A lot of the book blogs I still subscribe to don't post as often anymore. I'll be looking forward to your future (in)frquent posts), :). Has it now? I'm not reading that many book blogs anymore so I wouldn't really know. Maybe it's the Big Book Slumber and all the bookworms will be waking up again soon. At least one has. That'd be me, teehee! I knew you'd like this surprising comeback of mine! Funny how book bloggers have their own hibernation schedule, isn't it? I really have to get back into the read-book-blogs saddle to see what's been happening in the bookish blogosphere. Welcome back! I think a lot of the bloggers I follow started off at the same time and we're all getting to that "it doesn't matter if we don't post a lot" phase. Thank you! By the looks of it you've probably hit the nail on the head. Maybe the "more fun, less pressure* attitude is the result of the wisdom one acquires with age, hahaha! I'm glad that you're back. I was missing your interesting blog posts including your famous "picture garden". Welcome back! !